SPACELABS SL1030 battery, SL1050 battery (146-0055-00) (Requires 2 units). The SL1030 battery and the SL1050 battery are designed to be a drop-fit replacement for your 90367 Ultraview 1030 monitor or 90369 Ultraview 1050 monitor. This battery is built to meet or exceed the specs for your original Spacelabs SL1030 battery or 1050 battery. medical batteries are not all the same so when you choose the sl1030, sl1050 (146-0055-00) (requires 2/unit) (replacement for spacelabs) you choose durability and strength. only quality materials are used in every sl1030, sl1050 (146-0055-00) (requires 2/unit) produced. plus spacelabs's specs have been equaled or surpassed in its construction. thanks for choosing batterytex for your battery needs. 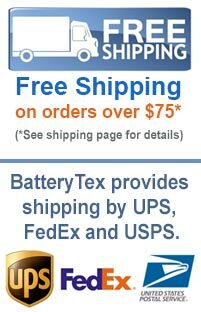 save time, money and hassle and get your batteries at unbeatable prices at batterytex.com. our battery specialists are standing by for any questions you may have: 1-888-825-6661. ask about bulk discounts! click here to find other medical batteries batteries. see more great products by manufacturer: spacelabs enhanced efficiency, power and longevity make today's batteries better and more cost-effective for consumers. most all of our batteries have a one year warranty unless otherwise specified. please feel free to contact us for actual battery warranty information.